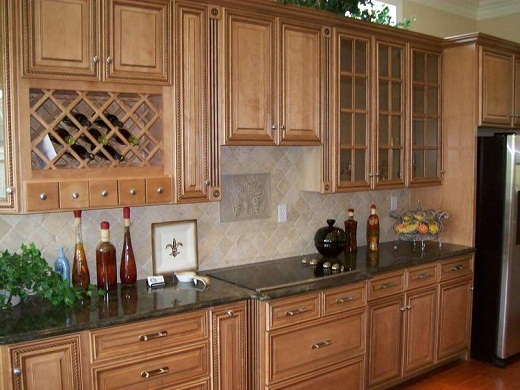 The kitchen base cabinet storage options today really utilize every bit of space available in kitchen cabinet design. From dishwasher base cabinets to base cabinet wine storage units, even appliance garage storage. Every possible item kept within a base storage cabinet is covered in current kitchen designs. Your first step in determining which types of storage solutions you are seeking in your kitchen cabinet design is to assess you needs. Ask yourself what type of shopper you are? Do you buy in bulk where a kitchen pantry cabinet with much needed space is crucial to your storage needs? Or maybe you love to buy exotic oils and spices in decorative bottles. Displaying these jars behind glass doors within your base storage cabinet may be preferable to you. This would serve the dual purpose of not only showing off their beauty but would also be a visual reminder to you to access the cabinet shelving in your top kitchen cabinets to retrieve these. Determine if you have lots of spatulas and cooking utensils compared to a low number of dishes. 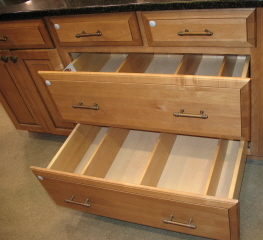 If so you may want to incorporate a 4 drawer base cabinet next to your range for your kitchen base cabinet storage needs. 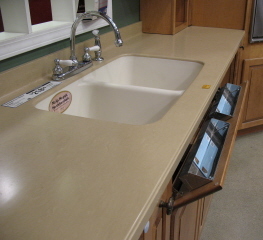 Perhaps you store most of your cleaning supplies in the kitchen, which would require a roomy base cabinet kitchen sink. Are you starting to get the idea? Generously plan for your base cabinet storage needs so you won't be without needed space later. 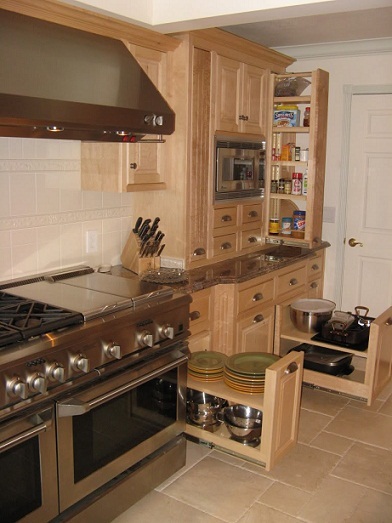 Are you lacking in space in your kitchen due to size constraints? Find a design theme to intersperse throughout your kitchen such as stainless steel and purchase a stainless steel dowel rod with metal hooks to attach under your upper wall kitchen cabinets. This is not only decorative, and similar to an island pot rack above a stainless steel island, but also functional. If you keep the contents within the kitchen to all the same material(such as stainless steel) you could hang other items which normally get placed in kitchen base cabinet storage as well. A paper towel rod, cooking utensils and even a plate rack can be hung from this stainless steel rod to rid your base storage cabinet of additional clutter. If your kitchen is open concept and effortlessly flows into a dining or family room try to place custom furniture and kitchen cabinet storage solutions in this room to match the kitchen. By placing a wall hutch or server with base storage cabinet space in the adjoining room you are automatically giving yourself 20-30% more cabinet space for storing extra dishes or other infrequently used items that normally fill up your kitchen base cabinet storage. Plus it pulls the two spaces together as well as adding to a antique kitchen cabinet furniture look. For visual appeal, base storage cabinet options include combinations of tall wall kitchen cabinets otherwise known as kitchen pantry cabinets, several 4 drawer base cabinet units, a roomy wall oven base cabinet storage solution, as well as deep base cabinet pull out shelves. The deep shelves work great with cabinet hardware drawer slides to really access every square inch of space. Kitchen base cabinet storage is your best option in stowing away all those kitchen accessories that you frequently use. The base storage cabinet designs available today are abundant.